Click on the four arrows bottom right for full screen view. This video is available in full HD. Click on the gear wheel to choose the quality level you want to stream. I’ll give my $0.02 in on the Ally canoe issue: I have a Pakcanoe, which is a very close relative of the Ally (the biggest difference is the Pakcanoe uses inflatable bladders to tension the frame and increase flotation, whereas the Ally is just tightly fit, with a certain amount of mallet use needed to get the frame together). However, I would not recommend them for children who are beginners. The simple reason is that the nature of the hypalon skin on aluminum frame construction means they are not fun to canoes to move around within. There is a foam layer that gives the ‘floor’ of the canoe a little more rigidity, but it’s not like a regular canoe … walking around in them is a bit of an unstable, squishy feeling. You cannot really stand on the frame members, so you have to mostly put your feet between them. So, with kids … who have a tendency to have a hard time staying on one position or place, I think it would be tricky. It’s for paddlers with positions that remain more or less the same. But if you multiple children who might need to shift about, a regular canoe will serve you much better. Thanks for your thoughts on the Ally canoe. I’m sure Cal will appreciate them. Also thanks for your link to the Lars Monsen video. I’d not see that one before. Hello Paul, very interesting video ! About bow drill polishing earthboard, my experience is that sometimes I faced with this, most of all using pinus sylvestris but also with black poplar; I always had solved the problem by putting some dry ground in the heart hole or some dry oak crunched leaves(just a little crunched leaves) but any dry and still hanging leaves also work. So, if the first try does not burn the heart hole, then I try again with dry ground or dry leaves; also a bit of more prussure helps. Thanks and I wish you a great week end. Hi Pierluigi, good to hear from you. Yes, getting that extra grip for the friction is all important. These little tricks can make all the difference. Cheers paul, good to hear from you. Totaly agree with you on the bushcraft ethos. The skills and knowledge are what matter not what kit you have on your back. Will try to get a couple more questions to you soon. There might be a possible suggestion for the “Brown Bag” question in your Online Elimentary Bushcraft course, in the module on Fire Management, “Clearing up after the fire”. The bit where you use a dry bag, or my modification on that, a small stuff sack, inverted to put copious amounts of water onto a fire site could be an idea for topping up a the bag instead of using your cup or bowl and/or can’t sterilise them in a fire. Yes, some other water-tight container, even a dry-bag would indeed work. Good idea. Thanks for the tip. Not being a chewing gum eater, these tubs have passed me by. I’ll have to see if I can get hold of one to try. Thank you for yet another episode. I am enjoying them immensely! And, at this point, I have two more episodes to watch, so Yea for me! 🙂 As for the selection of questions posted on the many platforms, I understand your reasoning. I wanted to let you know that I am enjoying the show, and pick up important tidbits of information. 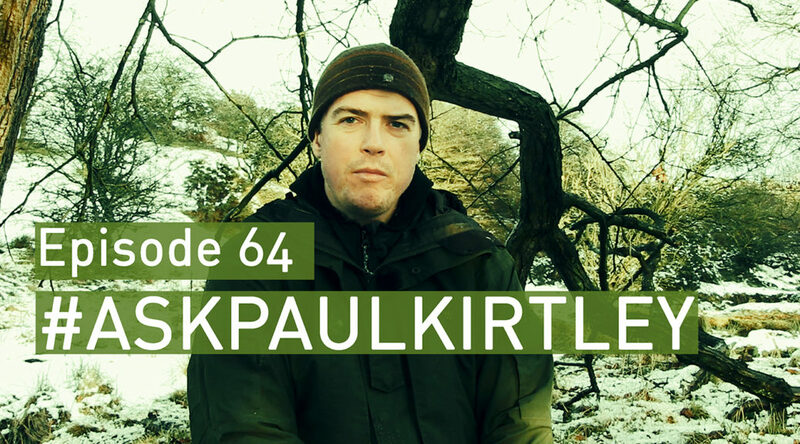 Please keep up the wonderful work in the “Ask Paul Kirtley” series. And I am now off to watch Episode 65! 🙂 Have a good one! Kevin B. On the subject of container sale for matches I wanted second what David said about chewing gum containers. I don’t normally buy chewing gum but saw these in a shop and bought one just for the pot. I now keep a small box of matches, fire steel, striker and spare batteries inside one in my pack. Also, if you know anyone who’s diabetic, the pots that the blood testing strips come in are brilliant for sorting matches on. They about the size of a film canister, but much thicker plastic and come with a moisture absorbing material in the lid as test strips are very sensitive to water. Diabetes is no fun but those pots, which are normally discarded are perfect for our needs to keep matches and other small water sensitive things safe. Hi Aaron, good tips. Thank you for sharing them. It’s much appreciated.